How can you expect to do anything in the world when you can't tie your shoes? This undated interview with John Steiner was done sometime between 1994 and 99 when I finished Crooked Cucumber. John mentions his early peace work here but volumes could be filled with the story of all he has done to try to make this world a more harmonious place. I was involved with him on work to bring about a nuclear freeze and that's just a highlight on his decades long path of peace and environmental concerns, hard work, and philanthropy. His spiritual path has also been strong and constantly renewing. Recently he has been studying Great Freedom with Candice O'Denver (no longer - 4-14). Maybe we can get a more thorough picture of where he's trod and what he's up to now but I don't think I can hold him down long enough to get a thorough answer because he's always engaged in something or things that are happening now. John starts off here by talking about the second most famous incident in Zen Center history in the Suzuki era, the best remembered and most often referred to event with the exception of Richard Baker's mountain seat ceremony, the highly emotional last public appearance of Shunryu Suzuki. This story happened during a Suzuki lecture at Sokoji on Bush Street. I wasn't there, was at Tassajara at the time, but I've heard this story related so many times that I feel like I was there. Go to Suzuki's Explosive Answer page for more accounts on this story. It was in the fall of 1968, October I think. I was sitting on a zafu in the second or third row from the front. At times Suzuki had trouble understanding what someone had said and an older student would tell him what the person had said. There had been a big anti war march on I think the previous day that I went to. I was quite concerned about the war. A guy in the back during the question and answer period said, "How come we're meeting here when there's a war going on out there? Suzuki Roshi didn't get it and I repeated the question. He jumped off the stage and came behind me put his stick on me and started hitting me over and over shouting, "You fool! you fool! You're wasting your time!" I remember that distinctly. When he got back on the stage he said, "How can you expect to do anything in the world when you can't tie your shoes?" When he was hitting me I thought, Oh this is like something out of the books and wondered if I was going to get enlightened. Afterwards Bob Halpern came up to me and said, "Steiner, you forgot to bow." I really appreciated that because it brought me back down to earth and showed me how self‑centered I was. Then Suzuki Roshi apologized to me and said, "The reason I hit you is I was reminded of what I went through in Japan during the war and it brought up that old frustration. He put his hand on my shoulder and I saw his thin arm, and from the underside loose skin hanging down just a little, and I was struck with his age and fragility. It was a very touching intimate moment. He wouldn't have done that if he hadn't felt that I could receive it and it was appropriate for me. The core issue was that he realized I wasn't ready to go out into the world yet. I came to sense it at the time but realized consciously later. I had actually had a thought like that two years before in 66 when I was a city. planning student at UCB. I was in on the first anti-war stuff - the Navy recruiting table incident. I was involved with Mario Savio and some others and everyone was at an impasse and I had a vision of bringing the various parties together and I got the administration, faculty and several factions of students to agree to a live round table discussion of issues on KQED. I did it solo. All agreed but then the administration started to have second thoughts and pulled out and then some of the faculty people pulled out. I realized then that I didn't have the personal power and integrity to be able to manifest my vision. A half year later I was at Zen Center. In my time there, especially the three years at Tassajara, I learned to listen to my inner voice. One morning I drove Suzuki Roshi to the Los Altos Zendo. The night before, Catfish hunter had pitched a perfect game. He didn't seem to know much about baseball but was struck that somebody could be called Catfish. He fell asleep and as I got toward Los Altos I realized I didn't know what exit to take. He woke up 100 yards before the right exit and told me to take it and directed me from there to the zendo. It reminds me of the lecture he gave at Tassajara where he said that when he was a new student he got the job of having to ring the wake-up bell but he had no alarm. He tried to stay up but kept falling asleep and finally fell asleep for good. Then he awoke and saw it was just at the right time. He realized then that he could wake up when he wanted to without a clock. It was a double wake up. He realized that there was more to him than he'd thought and that he could depend on himself. He always lost and forgot things. Once I answered the phone at the office on Bush Street and it was Okusan saying that Suzuki Roshi had forgotten his false teeth and I had to take them to him. They were in a container and I didn't look inside. Once in the early days at Bush Street I was walking in the zendo during zazen for some reason that I don't remember and I looked at Suzuki Roshi sitting zazen and his face looked like a death mask. Years later I realized I was looking emptiness in the face. 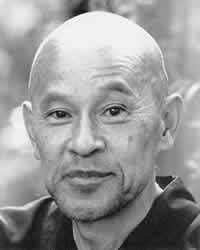 Suzuki Roshi's practice is now deeply in my soul. From Jeanie Stearns interview: I wonder if other people like me had similar experiences there. There are certainly many good people who came and went, as well as ones who stayed. There are a lot whose names I don't remember, but I do remember particularly John Steiner who, despite the Zen Center's emerging code of hip non-responsiveness to other people's personal problems - like Zen students weren't supposed to have those - brought me a cup of water as I was coming down with the Asian flu near the end of the 1968 -69 new year's session at Tassajara -- best drink of anything I've had in my life. It was just great - hot, dry and wonderful. I fell in the creek once and my clothes dried on a rock in about eight minutes. It was 28 years ago right now (1967). John Steiner and I were on trash detail and there was a thermometer in the shop and we'd check it out every day and it would get to 105. Judyth Weaver - I went to the ZC office on Bush Street across from Sokoji, walked up the stairs and met Yvonne. John Steiner took me over to see Suzuki Roshi and John and I sat on the steps and talked for an hour - it was his first day also. Yvonne Rand - In 1970 in the spring I think I went on a trip to the Southwest with Ron Patterson and John Steiner and Mary and David, friends of Ron's and Jack Elias. We went on a trip to the Havasupai canyon which is one of the side canyons that drains into the Colorado. We walked down there and camped down there for a while with Havasupai Indians. Went to the Grand Canyon, Canyon de Shay, Hotevilla on First Mesa and spent five days with Grandpa David. There were three of us who were Zen students, three who weren't and then John was like the emissary between the two groups. I remember sitting in Grandpa David's little house in front of his son's wood stove the first day and a half there, not a word - just sitting. The ones who were used to meditating were comfortable with that and the others were climbing the walls. A note from John Steiner with an invitation to see an exhibit of Kobun Chino's calligraphy. Kobun Chino (as we called him) Roshi came to America in 1966 to help Suzuki Roshi start Zen Mountain Center at Tassajara. I had the great privilege to know him at that time. He stayed and become a wonderful teacher in his own right and a master calligrapher. This year he moved from the Bay Area where he had lived all these years to Boulder to be in residence at Naropa. Margo and I attended a workshop he did at Naropa earlier this year. It was remarkable to reconnect with him after all of these years. He was a true Zen Master in a traditional way and in the best way. He and one of his three young daughters tragically drowned several weeks ago. We all lost a friend, a teacher, and a rare human being.